The primary objective of the ISU Exercise Clinic is to enable participants in having a program of lifelong physical activity that will reduce their risk for chronic diseases, such as cardiovascular disease, diabetes, and obesity. 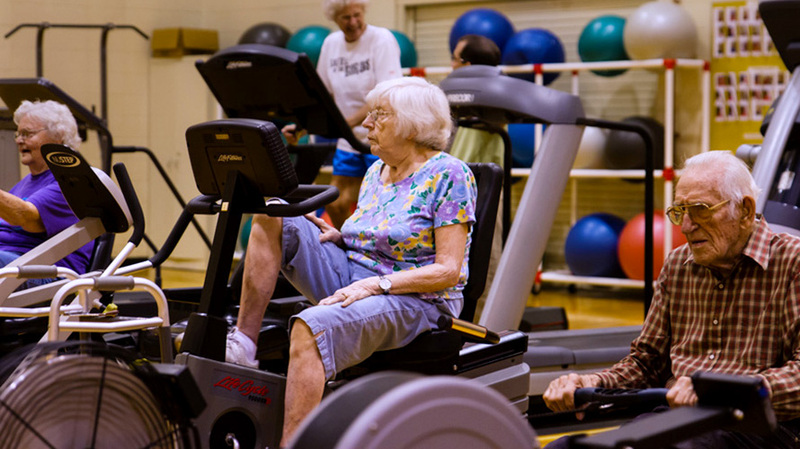 Thousands of community members benefit from adult physical activity classes via this program, which began in 1973. TV can result in too much couch time; however, the LIFE program demonstrates that technology can be put to good use. This intergenerational exergaming program resulted in positive health benefits for younger and older adults. The program used the Wii gaming system and was lead by specially trained students majoring in dietetics, kinesiology, education, and human development and family studies. How can families work together to tackle some of the challenges that aging can present? Extension to Families provides resources that help families have discussions about care needs in later life, as well as tools for caregivers. These tools help caregivers reduce stress, improve caregiving confidence, establish balance in their lives, communicate their needs, make tough decisions, and locate helpful resources. Is it easy to age in place in Iowa? A community-based project, Extension Midlife and Beyond: The Whole Picture, aims to address this question and help Iowa communities build more aging-friendly environments which are good for everyone. The program offers various resources, study circle forums, and shares success stories to encourage and inspire other communities. Aging individuals and their families can locate resources like Powerful Tools for Caregivers offered through Iowa State Extension and Outreach.